It seems to be the rage to love Jane Austen right now and for once, I completely agree with a fad. I love Jane Austen's writings. And I love them even more now having read this with my Brit Lit class. My professor was so enthusiastic about this book that it was pure pleasure to attend class each day. 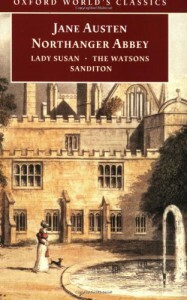 Northanger Abbey is a satire of Gothic novels. That's pretty clear. Catherine is a young girl from a large, middle-class family taken to the luxuries of Bath by her rich childless neighbors. There she meets and mingles with the society types. In the end, she is invited to visit Northanger Abbey where her new friends live. It's a dream come true for the Gothic-novel-loving Catherine. But of course, all is not as it seems. The characterizations of Catherine, her friends, family and acquaintances are superb. You know these people. You've met them. In real life. While the setting of Bath society is distant from us now, we have no trouble picturing the people and their interactions. I hope I never meet another Isabella or John Thorpe but they are out there. Each of Jane Austen's heroines is different and special. Catherine begins innocent and naive but is teachable and wants to learn. Her character really grows and matures through the book. She's a heroine to be admired by the end. One of the things I love about Northanger Abbey is that it is a book about and for readers. Austen was young when she wrote this but she understands exactly what makes a good story and she is constantly making the reader feel important and smart for reading it. She defends the reading of novels when many authors of her time were critical of novels as silly and frivolous. When Henry Tilney tells us that anyone who can't enjoy a novel must be intolerably stupid, we agree with him. Not only do we get a glimpse of the Gothic novel in this book, we see the novel of manners and the domestic novel played out. Even in this early writing of Jane Austen, her genius for storytelling is clear. This one is easier to read in some ways, than later works like Pride and Prejudice. It isn't as heavy. It has more comic relief. I just really love it and I am so glad I got to read it with a class and a professor that were enthusiastic about it also.